Helmet. This Air Wing is made to be easily adjustable, even with a gloved hand, and gives Five different angles of attack for different riding positions and situations. The Air Wing, which follows years of R&D in Moto GP, is designed to reduce drag, turbulence and buffeting giving more comfort and less noise. The Air Wing itself sits in between another Arai innovation, the newly designed diffuser, which has been designed to channel airflow, plus reduce noise levels at all speeds. 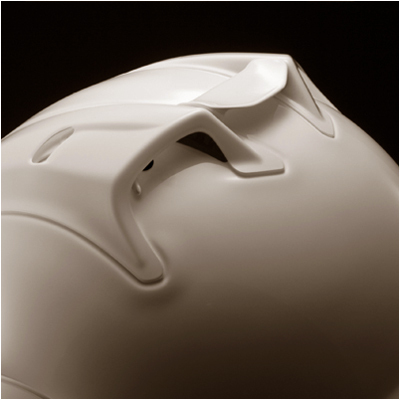 This RX7GP replacement Air Wing is available in 2 sizes XS (for XS and Small Arai RX7GP Helmets) and M (for Medium, Large and XL Arai RX-7GP Motorbike Helmets).